(P1) A British firm has developed a new product to help us save money. 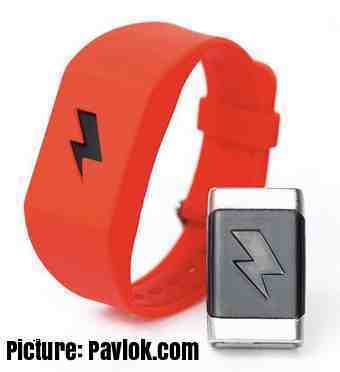 The product is a wristband that gives us an electric shock if we spend too much money. The wristband is called Pavlok. It is linked to our bank account. It knows how much money we have in the bank. If we go shopping and there is not enough money in our bank account, the wristband delivers a 255-volt electric shock to our wrist. This warns us not to overspend. The company is called Intelligent Environments. It wants to work with banks to help customers with their money. So far, no banks in Britain have said they would offer the Pavlok to their customers. They could start doing this in the future. (P2) The Pavlok wristband is part of the Internet of Things. This is the idea that everything in our life will be connected to the Internet. The CEO of Intelligent Environments, David Webber, said people liked the idea of the Pavlok. Shoppers would rather get a small electric shock in the store from the wristband than get a big shock later when they see their credit card bill. Mr. Webber said the Pavlok would be great for people who cannot stop spending because they have no willpower or their willpower is weak. He added that many young people suffer from the “ostrich effect“. This is when people stick their heads in the sand and buy things rather than look at how much money they have in their bank. Would you buy one of these wristbands? Why or why not? Have you or someone you know ever suffered from the “ostrich effect”? If so, explain. Do you think this device will fail or succeed? Why or why not? What is the wristband called?